Talk about a fast turn around time. A few days ago Brian K. Vaughn began teasing a project by himself and Marcos Martin, he announced it on Tuesday, and it was released digitally the very same moment. The where, why, and how of it all can be found in Travis McCollum’s news story about the project. But this is a review, and yes, Vaughn and Martin’s motives are interesting and their intentions quite admirable. However, those two things make a great news piece and not necessarily a quality book. 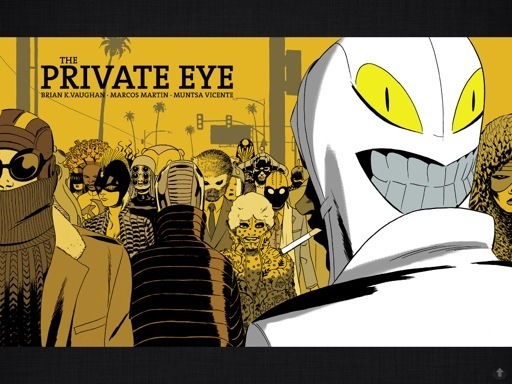 So, it’s a good thing that The Private Eye is a comic that not only blazes trails in its distribution model, but also features a vibrant world, memorable characters and is a comic that belongs right alongside the great work these creators have done elsewhere. The Private Eye is a story of America on the brink of its tricentennial. In this near future the Internet has collapsed, the paparazzi, who are more private investigators than smutty photojournalists, are outlawed and where everyone has a secret identity. Or lead character Patrick Immelmann is one such paparazzo, and like all great hard boiled detectives, has stumbled onto a case that may be his downfall. Brian K. Vaughn builds this three hundred year old America out of a mixture of new and old. There are the classic Blade Runner skylines that tell us we are in a future, but Vaughn also makes sure to keep the setting littered with scraps from our present day. This gives the world a grounded feel even amidst the walking tigers, camouflage cloaks, and hover cars. You can sense that the place you are seeing is not very far from what we know now, and that fact is both fascinating and scary. This first issue only picks at the corners of what is obviously a dense mythology and it gives the setting a denseness that makes it come alive. The Private Eye may be a puzzle, but to think it is merely plot driven would be a mistake. Much like in Vaughn’s Saga, the mythological elements are balanced with an intriguing lead character. Patrick Immelmann, P.I., is as big an enigma as the country he inhabits. He’s a man who does an illegal job, that comes with high risks, but big cash rewards. Yet, he has a moral code and an obvious sense of family. I want to know more about Immelmann and that’s the mark of any great character. However, Vaughn wisely refrains from giving the reader a lot of exposition upfront and that leads to a wonderful sense of discovery in The Private Eye. The writer is playing a cat mouse game with the reader, all at once introducing and then solving a mystery, only to introduce another right behind it. This method keeps the narrative barreling forward and gets the reader excited about the things they are confused about, rather than frustrated at them. There is something incredibly tactile about the world of The Private Eye and that is thanks to the wonderful art of Marcos Martin. His pencils are finely detailed, his panel design is kinetic, and the use of colors makes the book pop off the screen. Notice,how there are whole panels focused on shelves of books, newspapers strew across the ground, and vinyl records being spun. These are context clues by Martin and Vaughn placed around The Private Eye to initiate the reader into its world. If you pay close enough attention the visuals will give you the skinny on what this tricentennial is before the words do. That’s amazing, next level work, that makes every subsequent read just as enjoyable as the first. Buy it- You can literally pay whatever your want for this book, and so it’s a no brainer that you should at least give it a try. But, trust me this is worth just as much as any book on the stands today. So, if you do get it for free and if you love it, why not buy a second copy for and drop a proverbial penny in the proverbial jar? Brian K. Vaughn and Marcos Martin are superstars and simply put this is top flight work by top flight talent. The story is filled with personality, a great lead character and is strong science fiction that poses unique questions. The art is detailed, gorgeous, and eye catching. So, if you are a fan of Saga, Chinatown, or comics in general you owe it to yourself to pick The Private Eye up.